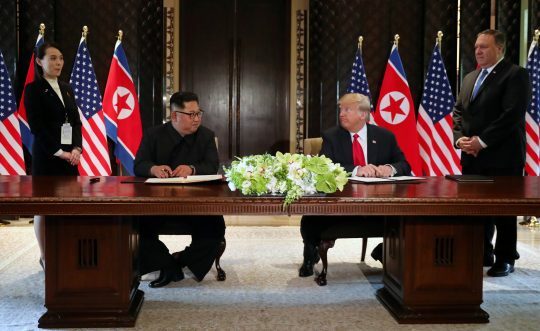 SINGAPORE (Reuters) – U.S. President Donald Trump and North Korean leader Kim Jong Un pledged on Tuesday to work toward complete denuclearization of the Korean peninsula while Washington committed to provide security guarantees for its old enemy. After initial exchanges lasting around 40 minutes, Kim was heard telling Trump through a translator: "I think the entire world is watching this moment. Many people in the world will think of this as a scene from a fantasy…science fiction movie."